We continued our tradition of offering something a little different for our December presentation with a full-length screening of a locally produced river film! Lupus is a tiny little river town in Moniteau County across the river from Eagle Bluffs Conservation Area. For many in the area, it’s known for its houses on stilts and its annual ChiliFest, when the town turns into on big musical and culinary party. As a labor of love, Lupus resident Rhonda Cleeton and friend Robert Hemmelgarn teamed up to produce a wonderful tribute to the town, called “Lupus: Village on the river”. 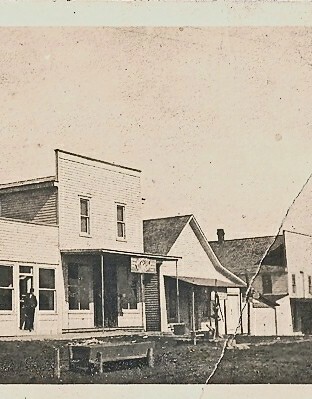 Using the stories of the talented and hardy residents of Lupus, the film weaves a personal history of the town, including its beginnings as a railroad town in the 1880’s, through the devastation of the Flood of 1993 to the present, where the Lupus General Store serves as a musical destination for troubadours from around the country. 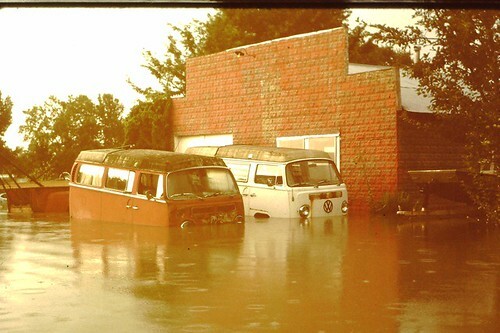 A couple of VW vans become casualties of the 1993 flood as the rains continue to fall. Courtesy of Doug Elley.